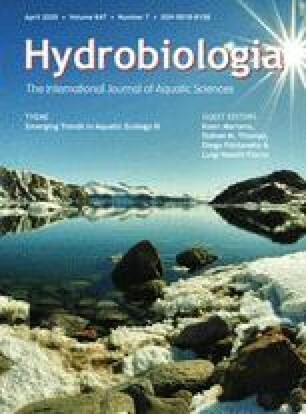 In the evaluation of the role of lake restoration programmesin situ measurements of the filtration rate of the freshwater musselDreissena polymorpha have been performed in Lake Wolderwijd, The Netherlands. The filtration rate mainly depends on the suspended matter content of the water, and shows an inverse exponential relationship with this factor. The filtration activity is temperature indifferent between approx. 5 and 20 °C. At low temperatures the filtration rate drops abruptly, at high temperatures gradual inhibition occurs. The filtration rate shows a sigmoidal relation with the length of the mussel. The largestD. polymorpha have a diminished filtration rate compared to animals of smaller size. This might be a degenerative feature of the oldest mussels. In Lake Wolderwijd a population density of 675 per m2 is required to compensate phytoplankton growth by grazing. Manipulation of the size of the population can be executed by adding suitable substrates for the mussel.